Mexico's President Enrique Pena Nieto speaks in the British Houses of Parliament on March 3, 2015, in London, England. 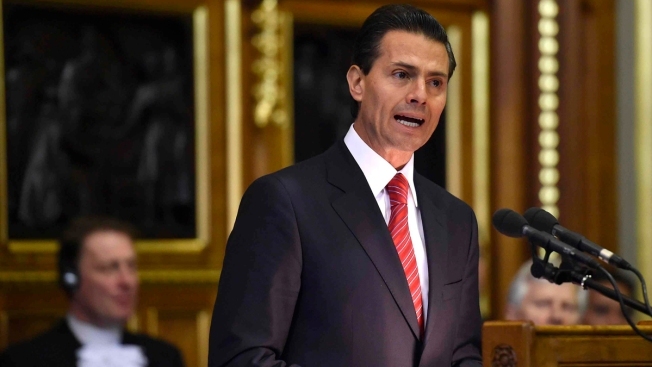 Mexican President Enrique Pena Nieto compared the language of Republican presidential hopeful Donald Trump to that of dictators Adolf Hitler and Benito Mussolini in an interview published Monday, and said it has hurt U.S.-Mexico relations. Asked about Trump, Pena Nieto complained to the Excelsior newspaper about "these strident expressions that seek to propose very simple solutions" and said that sort of language has led to "very fateful scenes in the history of humanity." "That's the way Mussolini arrived and the way Hitler arrived," Pena Nieto said. Pena Nieto until now had avoided direct comments on Trump, who has pledged to build a wall along the two countries' borders. Trump also has said Mexican immigrants bring crime and drugs to the U.S. and are "rapists." But as the New York businessman has built a lead in the GOP primary, current and former Mexican officials have begun to publicly express alarm. Former Presidents Vicente Fox and Felipe Calderon also have alluded to Hitler in describing Trump. In the interview with Excelsior, Pena Nieto said "there is no scenario" under which Mexico would pay for the border wall, as Trump proposes. But he said he would work with whoever eventually wins this year's U.S. presidential election and to maintain a climate "of mutual respect and joint agreements." In another interview published Monday, with the newspaper El Universal, the president said he would be "absolutely respectful" of the U.S. political process, but said, "It appears to me that (Trump's comments) hurt the relationship we have sought with the United States."